You're getting double the recipes today as two of my monthly blog challenge reveal days fell on the same day. This is my post for this month's Secret Recipe Club. Come back at noon for my post for this month's Crazy Cooking Challenge and my first Thanksgiving Week post. The Secret Recipe Club is a group of food bloggers who secretly make one of someone else's dishes and post them all on the same day at the same time. This is my fourth month participating. It's really fun, choosing a recipe to make, making the recipe, then reading about everyone else's recipes. It's a great way to "meet" other bloggers and check out some great blogs that you never knew about before. 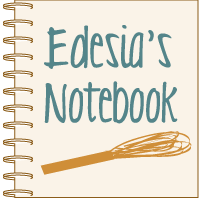 This month I was assigned the blog, Recipe Taster. Its author is Alessio, an Italian currently living in Germany. Alessio is a very interesting guy! He has a Masters degree in physics, makes jewelry, does catering, and somehow finds time to blog about the delicious food that he makes. While perusing his archives in search of a recipe to make, I saw that he has many lovely pasta dishes, like his Middle Eastern Raviolo with Cranberry-Sage Butter Sauce. I also saw lots of German recipes that I would like to try, like his Schwäbische Bierbrezeln and his Sauerbraten and Schupfnudeln. But in the end I went with something completely different. As soon as I saw his Salmon en Croute, I knew that was what I was going to make. While it used ingredients I was familiar with, I had never made anything like this before and was ready to challenge myself. It's basically salmon fillets wrapped up in pastry with a creamy spinach sauce on the inside. I made a few changes to Alessio's recipe. Here's my adaptation. Preheat oven to 400°. Remove pie crusts from fridge to bring to room temperature. Heat olive oil in a large sauté pan over medium heat. Add the onion and sauté until onion is softened but not browned, about 5 minutes. Add the spinach and cook until wilted, turning occasionally. Place spinach/onion mixture in a small food processor and pulse a few times to chop up the spinach. Place cream cheese in a bowl and stir to make creamy. Add the spinach mixture and lemon zest and stir to evenly incorporate. Roll out the pie crusts. Season salmon fillets with salt and place a thick layer of cream cheese mixture on one side. Place each salmon fillet, cream cheese side down, in the middle of each pie crust. Fold edges over and press to seal. Flip packets over, place on baking sheet, and cut small slits in the pastry as vents. Brush with beaten egg. Bake for 30 minutes or until the pastry is crisp and browned. Remove from oven and let cool 10 minutes. Cut in half on the diagonal. Serve with the rest of the spinach/cream cheese mixture as a sauce. Alessio made his own shortcrust pastry for this, but I'm not a baker and prefer to buy my pastry from the store. I thought the store-bought pie crust worked really well in this dish. And it was already the perfect size for the salmon fillets I had, so there was no rolling out or cutting down. Alessio used a combination of spinach, watercress, and arugula, but I simplified things buy using just spinach. He also wrapped up a whole salmon fillet, instead of cut up fillets, like I did. I served this salmon over a long grain/wild rice blend. Spinach and onion after wilting, before going into the food processor. Spinach/cream cheese mixture. You can use less cream cheese if you like; I didn't feel like cutting it up, so I used the whole brick. Spread spinach/cream cheese mixture on salmon and lay face down on the pie crust. Wrap up like a Christmas present! Alessio folded his up so that the join was on the top, but I knew if I did that, there was no way I would get it to look good enough for a picture! Cut slits in them to vent. My slits were a little too big perhaps; the ones on the right packet opened up too much during cooking and didn't come out as pretty. This makes such a pretty presentation that I would make it for a dinner party. If your salmon fillets are smaller than mine were, you may have to cut up the pie crusts and fold up your packets a little differently. This recipe was a great success. My husband was so impressed by it! And it was super easy. I'm really glad I challenged myself to make something completely new to me. Thanks for the recipe, Alessio! Don't forget to come back at noon to check out my Crazy Cooking Challenge Post and the first dish of my special Thanksgiving Week series! My friend makes this and she always "conveniently" forgets to give me the recipe! Thank you so much for an opportunity to surprise her next time she is at my house:) Alessio's blog sounds interesting, will stop by and check that out as well... Would like some German recipes! This looks SO delicious, and perfect for a dinner party, like you said. I wonder if you can use other kinds of fish? I don't see why not. You may need to adjust the cooking time if you use a fish that cooks quicker, like tilapia or something like that. I hope your friend likes it! And yeah, Alessio's German recipes look really good. What a great pick! Even with the changes you made to simplify the dish, these still look worthy of a 5-star restaurant (or just a fancy dinner party at home). Very haute cuisine! This is a gorgeous recipe, love it. My husband especially would adore this, I'm saving the recipe. This looks great! So fancy, yet so simple! Always a great combination!!! OMG... Salmon, spinach AND cream cheese... three of my favorite foods! I'm gonna have to try this one for sure! This looks delicious. I love salmon and cooking it this way looks fun. Just stumbled across your blog and I'm delighted! So man delicious looking recipes! The pie crusts are so intriguing. I wonder how this would do with some phyllo pastry? I'm sure you could do the same thing with phyllo. I have never used it before, so I don't know if you would have to adjust the baking time or not. If you try it with phyllo, let me know how it works out. Made this for dinner last night using steelhead instead of salmon. The cooking time was the same, as were the taste and texture since the fish are so similar. Thanks for this super easy and delicious recipe! I will definitely be making it again. I had to google "steelhead" to see what it was (we pretty much stick to tuna and salmon around here as far as fish goes). I am so glad you liked the recipe, and thanks so much for taking the time to comment and let me know!